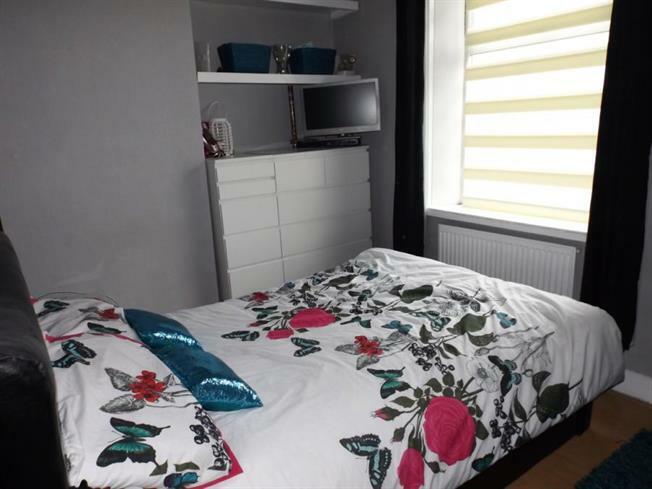 2 Bedroom Terraced House For Sale in Burnley for Offers Over £70,000. This stone built mid terrace comprises entrance hallway, lounge, dining room and modern kitchen on the ground floor. Two bedrooms and bathroom on the first floor, the property is gas central heated, double glazed and has a rear enclosed yard area. Entrance is gained at the front of the property by a uPVC door into the hall, radiator, light point, stairs leading to the first floor and access into the dining room. Double glazed window to the front, open archway leading to the dining room, laminate flooring, radiator, television point, two wall lights, built-in meter cupboard, light point and dado rail. Open arch leading to the lounge, door leading to the hall and kitchen, light point, dado rail and radiator. Double glazed window to the rear, a range of wall and base units with complementary work surfaces, stainless steel sink and drainer unit, electric hob, stainless steel extractor, electric double oven, door to reception room two, plumbing for washing machine and access to the under stairs storage cupboard. / Utility, Single glazed window to the rear, plumbing for dryer, space for fridge/freezer, light point and provides storage. Double glazed window to the rear, light point, radiator and built-in storage cupboard. Double glazed window to the front, built-in wardrobes, radiator, light point, laminate flooring and television point. Double glazed window to the rear, radiator and light point. Internal window to bedroom one, low level WC, pedestal wash basin, panelled bath with shower over, built-in storage cupboard and stainless steel towel radiator. To the rear of the property is a rear enclosed yard area with walled surround, gated access and gravelled area.